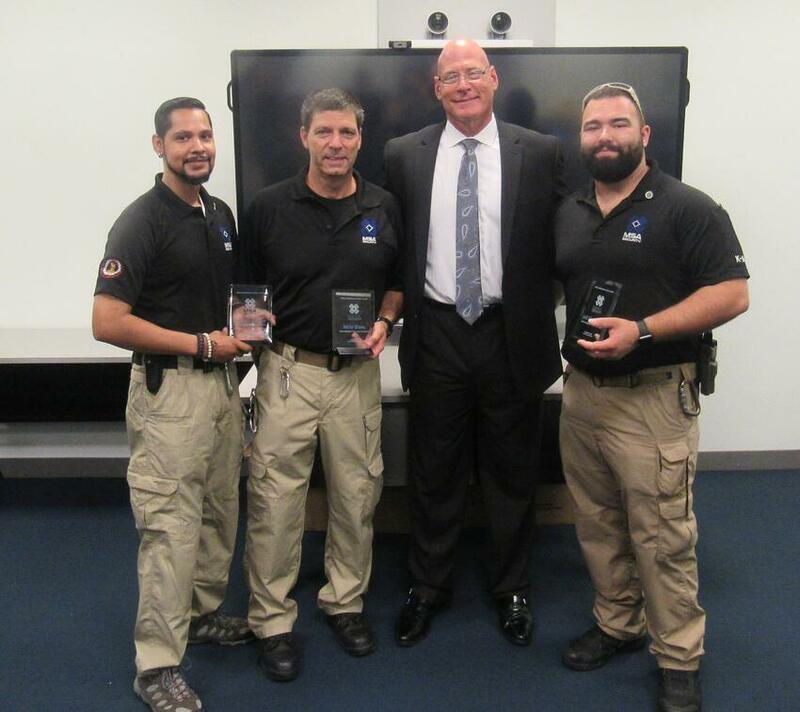 MSA Security announced the recipients of their CEO's Meritorious Action Award, a special recognition for employees who have gone far beyond their duty on the job. "We created this award to recognize our handlers. They already provide a great service by keeping the public safe, but also because they work much of the time in public areas, they sometimes respond to individual citizens in emergency or life threatening situations. It is my honor to be the first to congratulate Ed, Mike, Alex, Dan, Roldan and Jeff on their incredibly brave, selfless actions helping others," said Glen Kucera, Chief Executive Officer. "We are excited to announce this new award as a means to acknowledge those who embody the values and spirit of MSA," said Michael O'Neil, Chairman of MSA Security. "Many of our employees are retired military, law enforcement, first responders, and reservist personnel with a keen understanding of high-consequence security. This background and rigorous training makes them ready to take action and sometimes selflessly put themselves in harm's way to help someone in need." Mr. Ed Dombrowski, who was on post on May 20, 2018 when he rendered aid and assistance to an assault victim who had been beaten and robbed in Chicago. He tended to the victim until paramedics arrived. Mr. Mike Klein, who assisted the police in the apprehension of an assaulter on May 9, 2018. He subdued the subject and held them down until the police arrived. Mr. Alex Rickey and Mr. Dan Campbell, who were serving at Coachella in the early hours of April 27, 2018 when a temporary housing trailer caught fire. They entered the trailer and rescued those sleeping before flames engulfed the entire structure. Mr. Roldan Ramos, who administered CPR to an unconscious individual near his post on February 28, 2018. He sustained them until additional medical assistance arrived. Mr. Jeff Husarenko, who provided aid to injured victims of the terror-related vehicle ramming in lower Manhattan on October 31, 2017, an attack which led to mass casualties and multiple fatalities.